Send mailings to your clients and prospects quickly and easily with our Mailing List Manager. Add a newsletter signup form to any page (or all pages) on your ecommerce web site and allow recipients to subscribe or unsubscribe at any time. You may also add, edit and delete email addresses with ease using our web-based, icon-driven administrator. You can even send yourself test mailings before sending to your list in order to view your mailing just as your customers will see it before you send it. Newsletters and other mailings can be sent in either standard text or full HTML mode for stunning, professional results. Using the administrator's built-in list export feature, you can download your entire mailing list to a text or excel-ready file for easy import into other applications. Mailing List Manager integrates automatically with CustomCart ecommerce software to add a shopper's email address to your mailing list if they so choose. This allows you to send follow-up mailings and special offers to past customers. Mailing List Manager's web-based, icon-driven adminstrator is quick and easy to use. You can manage your mailing list, adding, editing, and deleting email addresses as you wish. Unlike most other internet technology companies, we do not leave you out in the cold. If you need help setting up or using our software applications, we are here with free and unlimited technical assistance. In addition, we offer Internet Support Requests for ongoing issues and an extensive FAQ of valuable information and articles about using our ecommerce products. To compete in today's ecommerce environment, you need every advantage you can get. Adding to your web site the ability to send HTML and text-based emails and newsletters can help propel you to higher sales, better customer retention, and improved site loyalty. 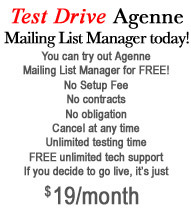 And at just $19 per month, Mailing List Manger is cost-effective and sensible - sign up today! Sign up today and take as much time as you like to setup and test Mailing List Manager on your ecommerce web site. When you sign up, mailing List Manager is in "Test Mode" and operates completely free of charge until you switch to "Live Mode". There are no contracts, no setup fees, and unlimited free testing. And your first 30 days in Live Mode are Free. Sign up today! Your first 30 days in Live Mode are Free. Note that while in test mode, live mass mailings are disabled as is file exporting. Test mailings may still be made.